KEL Recruitment , Govt Jobs In Kerala Electrical & Allied Engineering Co.Ltd. 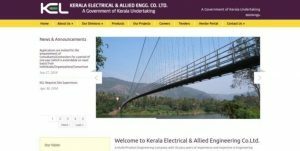 Site Engineers (20 Vacancies) – Last Date 25 September, Kerala Electrical & Allied Engineering Co.Ltd. (KEL) recruits Site Engineers post. Candidate B-Tech., Diploma with experience can apply. A Multi-Product Engineering Company with 50 plus years of experience and expertise in Engineering Industry, and now proudly serving an envious client base including Defence, Irrigation and Power Projects, Space Research Organizations, State Electricity Boards, Indian Railways and the General Public both in India and abroad. The Company which is a Public Sector Undertaking fully owned by Govt. of Kerala has four state-of-the-art manufacturing units spread across Kerala and has a pan India presence with its Sales and Service unit in all major metros and selected cities.